A metallic wallpaper accent wall adds some sophistication to the home. We’ve talked before about accent walls and how they are great for adding a little interest to a space. While you can opt to simply paint an accent wall, choosing to use wallpaper is a great way to add a bit more depth and dimension that you can’t get with just paint. Many homeowners find that wallpaper accent walls add a more luxurious feel and make for a more sophisticated look. Here are a few ways that you can use wallpaper accent walls to create interest in your home. Textured wallpapers come in all sorts of different styles. You can choose wallpaper that feels like a woven cloth, creamy velvet, and even smooth wood. Embossed vinyl wall coverings, such as Thibaut’s Texture Resource line of wall coverings, add depth while also being easy to clean. This makes using textured vinyl wall coverings a great way to spruce up high traffic areas without having to worry about upkeep. For a soft, casual look that adds texture and space, consider a grasscloth or linen wall covering. We recommend the new Ronald Redding grasscloth wallpaper. When you come to visit Columbia Paint, take some time to flip through the lookbook; you’ll be surprised by the variety of options! 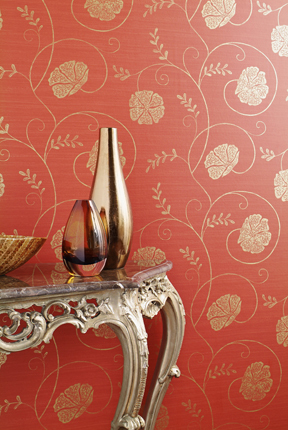 York Wallcoverings has dubbed 2016 as the Year of Gold, and we couldn’t be more excited. Metallic accents are trending as a way to make the home more stylish and sophisticated. Especially with fall and the holiday season right around the corner, gold tinged wall coverings are a great way to add a little brightness and cheer to the home. But don’t worry, metallic wall coverings are still stylish in other parts of the year; the delicate gold plated designs of these luxe wall coverings lend a sense of sophistication and elegance to any room in the home. If you have several plain walls in your home, then a single patterned accent wall really stands out. Patterns are a great way to add a little energy to a space. If you have low ceilings, adding wallpaper accent walls with horizontal stripes is a great way to create the illusion of a bigger space. If you really want to impress, consider a wall mural from Brewster Home Fashions. These stunning photorealistic accent walls create a sense of awe with the grandiosity of natural elements or the impeccable style of a work of art. Are you ready to spruce up your home with some unique and eye-catching designs? Columbia paint is having a summer sale: 50% off Graber products and 30% off Hunter Douglas products, good through September 20th. Don’t miss out!